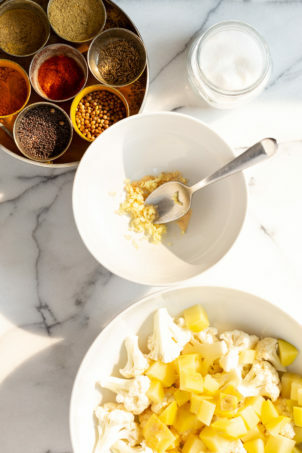 Aloo Gobi is the quintessential part of an Indian spread. 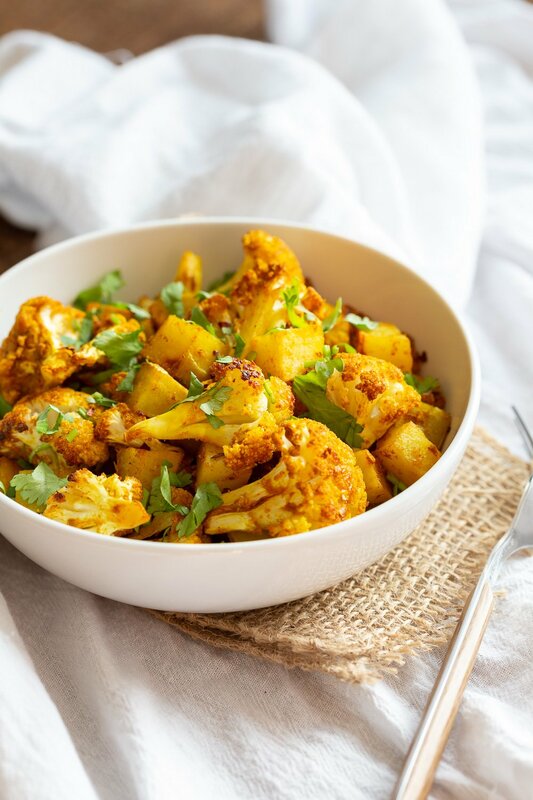 Spiced, perfectly cooked bites of potato and cauliflower, often served along with dals, curries. Aloo gobi is made almost exactly the same way at my mom’s since forever. No one wants to mess with perfection! The recipe, process or spices vary by region, family. The everyday home cooked version is usually a dryish seasoned veggies. Not all Indian dishes(even if they are called curries) have a sauce. Restaurants often will make it into a curried/saucy dish. Try this version or gobi masala from my book, for a saucy Aloo gobi, that can be a meal served with flatbread(gf options). My family recipe is a Punjabi recipe with spices such as cumin seeds, coriander, turmeric and loads of ginger and garlic. The skillet version posted way since when is made every few weeks. I’ve changed it up slightly and I also started baking it. The process is much easier and needs less active time, as you don’t need to be in standing the kitchen. Also the baked aloo gobi turns out fabulously flavored, perfectly cooked and no mushy Cauliflower! Aloo Gobi in my house has got to be dry evenly spiced side without a sauce. Its wet enough from the moisture in the veggies. Just a few ingredients and gorgeous golden veggies is what we are aiming for. You can change up the spices to preference. For less roasted crisp, just use a smaller baking dish so they are spread almost double layer. 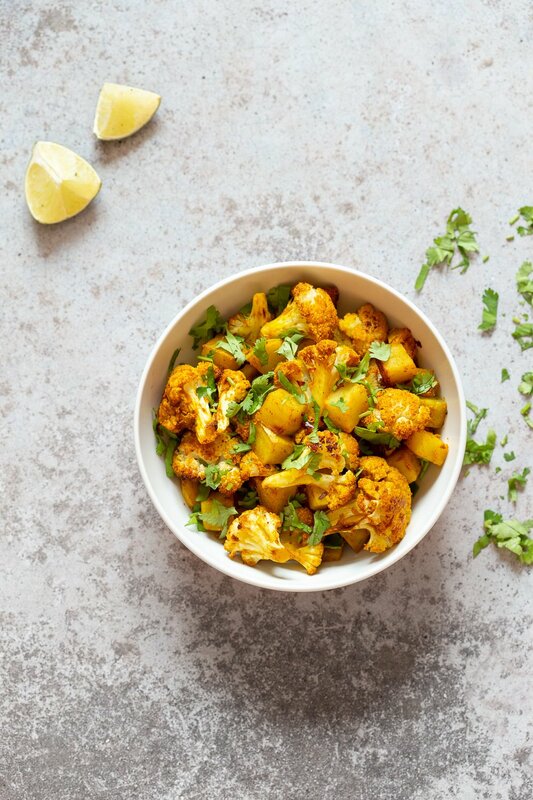 Believe me, you wont go back to the skillet or Instant pot for aloo gobi once you try this Roasted Aloo Gobi! Green Bean, Carrot Poriyal – Green beans coconut carrot stir fry. Okra Kuzambu – Okra in tamarind coconut sauce. 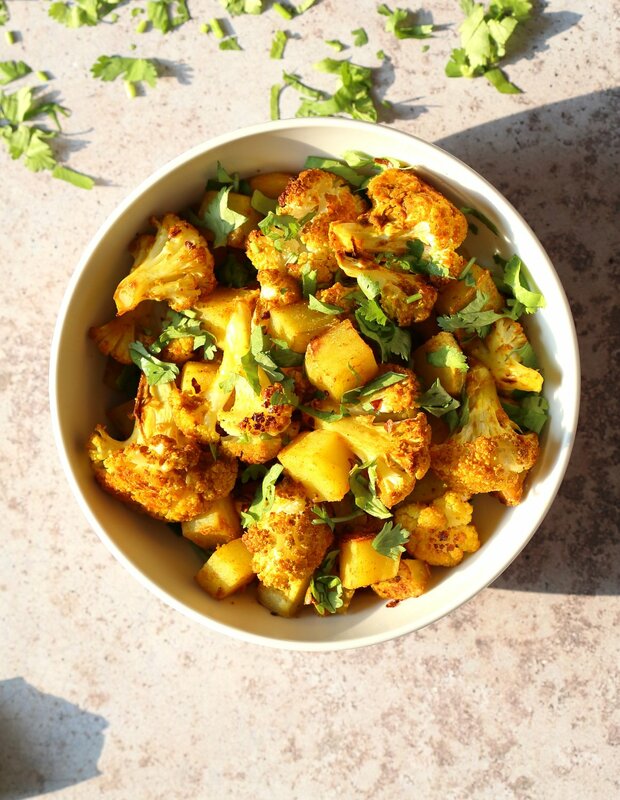 Above, veggies tossed in water+spices, spread on a larger dish for crisp Aloo Gobi. Below pics, veggies tossed in dry spices, in a smaller baking dish for softer aloo gobi. This Aloo Gobi takes just 10 mins to put together. Toss with spices, put it to bake, and done! No Standing around, no Mushy Cauliflower! Same Amazing Indian flavor and excellent texture. If you make it, let me know in the comments how it turned out! You want to keep the size of the cauliflower florets and potatoes similar. Too large florets or potatoes and they will not pickup flavor or cook through evenly. Too small of either will tend to have burnt edges. Spread the veggies so that they are in a single layer with just a bit of overlapping for dry Aloo Gobi. Too spaced out and they will be too crispy like roasted veggies. Spread them with overlapping for softer, less crisp (I put them in almost a double layer in smaller dish when making it for my Dad who likes his soft and slightly moist. The veggies have enough moisture and they will sauce(moisten) more as they sit in the serving dish). You can try different pan size to see what pan and spreading amount gives you your preferred crisp and texture. As with the tips for my Roasted Brussels sprouts post, you want to use stoneware for best results. And cover the veggies for a portion of the baking. 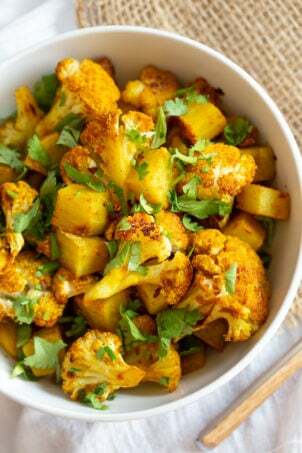 Baked Aloo Gobi - Indian Spiced Potato Cauliflower Side. Tips for the Best Aloo Gobi Subzi that bakes perfectly every time! Vegan Glutenfree Soyfree Nutfree Recipe. Chop the cauliflower into small florets and put in a large bowl. 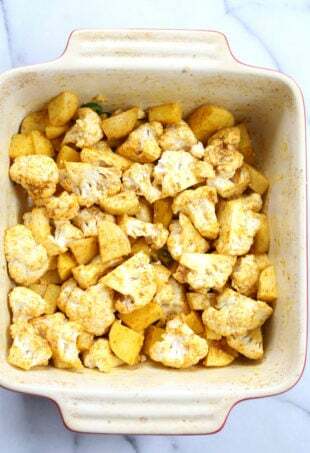 Chop the potatoes into small cubes (less than 1/2 inch) and add to the bowl. In a small bowl. Mix the 1/2 tsp turmeric and the rest of the ingredients under spicing until well combined. Add the spice mixture to the large bowl and toss to coat. Alternatively, Add the minced ginger, garlic, oil to the bowl and toss well. Combine the turmeric, cumin, coriander, garam masala, cayenne, salt in a small bowl, mix well. Sprinkle over the cauliflower, potatoes and toss well. Let the cauliflower and potatoes sit for a minute. Sprinkle some more turmeric and mix lightly (optional). 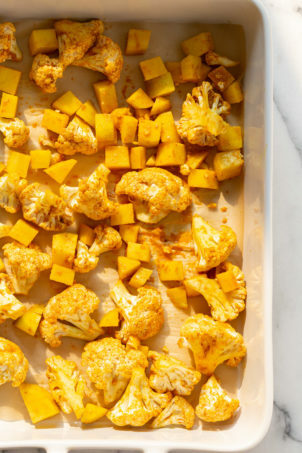 Spread the veggies in a stoneware or ceramic baking dish. Spray oil. See Tips above on how to spread the veggies and pan size to choose. Bake at 400 deg F (204 C) for 20 mins, then cover with parchment and bake for another 15 mins or until tender to preference. Taste carefully and adjust salt and spice and mix in. garnish with cilantro and some lemon juice. Serve hot with dals, curries, flatbread. Perfect side to chana masala or butter tofu. Variations: Add 1 hot green chili, finely chopped with the ginger and garlic. Change up the spices, use panch phoron blend instead of garam masala for achari aloo gobi. Add thawed peas in the last 10 minutes of baking for Aloo Gobi Matar. Add 1 to 1.5 cups cooked chickpeas to amp up the protein. Increase the spices and salt to preference to accommodate the added chickpea volume. Oilfree: Omit the oil. Cover the Veggies half way through(about 5 mins longer). I seriously want to lick my screen right now. 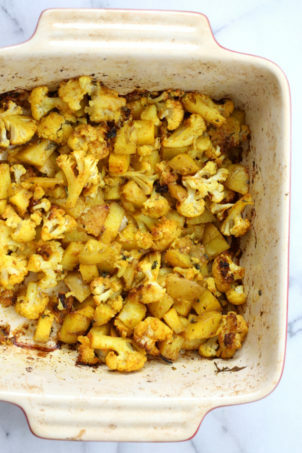 I believe this may be a good recipe to get me husband to enjoy cauliflower… Must try! Made this tonight. It was delicious! And easy! I’m not trying to be a jerk, but I’m not sure what constitutes a medium potato. Can you give us the weight or volume for the chopped potatoes, please. Made these and they turned out great. Will surely try them again. Richa receipes are fantastic. Religiously us the Indian cook book every week(it’s my bible). Thanks for the inspiration. This dish is fab. Greetings! Since you are recommending a stoneware baking dish, does this mean that a glass dish would not give the best results? Just made this tonight for my girlfriend for as part of my Indian love feast along with your Vegan garlic Naan n everything came out amazing. As always when using any of your recipes. 💖Thank you. Aloo gobi is one of my favorite Indian dishes! I love that yours looks so pure, healthy, and aromatic. Your mother knows how to whip up the perfect Aloo gobi–I totally agree that it would be a disservice to modify it in any way! This is most certainly going into my recipe bucket list–I’ll make this recipe with sweet potatoes, kabocha, or purple potatoes too! I have a question. I am making the oil free version of this. In those directions it says to cover half way through, and then says 5 mins. The regular directions say to cover about halfway through. What’s this refer to? Also thank you for including oil free options. I used to cook a lot of Indian food but when I gave up oil to treat a health condition I thought I’d never eat aloo Gobi again. The regular one gets covered for 10 to 15 mins, so a bit less than half the time. For oil free version, cover it 5 mins more. You also want to use a smaller dish so that the veggies are not too far apart. that will help not lose too much moisture while baking. Thanks so much! Your response was so quick that it wasn’t even time to cover the food yet. This is really a delicious dish. I didn’t miss the oil at all! Would a dutch oven work? yes should work fine. Keep the veggies to about 2 layers and notmore than that. My oven is probably hotter than yours. Because the cauliflower over cooked slightly. But the flavours were delicious. My husband and 3 year old devoured it! awesome! Try larger florets, wider pan and a slightly lower temp. Do you have any recommendations for an oil you particularly like for this? Do you tend to go with a more neutral oil or a flavorful one? yes any neutral such as safflower, sunflower or canola. This came out wonderful. I ate it almost straight out of the oven for a VERY early lunch. I added chickpeas and peas and so this is such a satisfying main dish. The seasoning is perfect – upped it a bit to accommodate the chickpeas – and so is the texture of the cauliflower. Wonderful recipe, Richa. Can I substitute the potatoe with sweet potatoe.? next day for dinner after 24 hours of marinating the veggies in the spices. It turned out better than the first time. I love such recipes where I can do all the prep work before hand for the next dinner. Have made this multiple times since January. Love it!